I posted a couple of weeks ago about Robbert Bobbert and the Bubble Machine's amazing new record for kids. Robbert (aka: Robert Schneider of the Apples in Stereo) was kind enough to take time out from recording to answer a few questions from Posterband. Bubble Machine had no comment. So when I first heard you were making a record for kids, I was really excited, but equally curious: what inspired you to bring your pure pop jams to the young people? Little kids need good music more than anyone. Their developing ears cannot defend themselves against music of poor quality. I feel it's very important to do something special for kids. I put as much into the Robbert Bobbert and the Bubble Machine CD as I do with any project. Music for kids is the ultimate form of psychedelic pop... You can include all of the fun and colorful and odd sounds as you want. In fact, it is your duty to put them in there. It's like making a colorful little clock or music box where all of the parts work together in a musical system. I tried to make each song a self-contained little box of toys and sound effects that kids will find fun to play with. Are you a cool dad? Or a cooler uncle? An eternal child? All of the above! I really do try to be a cool big brother to my little brothers, and a cool uncle to my nieces and nephew, and a good dad to my son Max, who is 8. I am not so much worried with being a cool dad, as just a good dad. I think being cool is both not really part of the "dad" job description, and also, there is no way my son is going to think I am cool as he grows up, no matter how hip I am. I recorded some of the tracks for my Robbert Bobbert album about 15 years ago when I was 21, and my brothers were little. I would give them cassettes of children's songs for their birthdays. Lately, I've written songs inspired by my son. The song "Gravity" was written for the science fair at my son's school. I did a physics presentation for 1st and 2nd graders, and had the kids sing and clap along. My four year old loves the new Robbert Bobbert and the Bubble Machine record, but he's also been known to rock out to his dad's Apples in Stereo records on occasion. There's a lot of great "grown-up" music out there for kids to explore. I'm curious what records (for kids or grown-ups) were important to you when you were a little one? That is awesome that your kid loves pop music! I loved the Beach Boys and listened to Endless Summer over and over again when I was a kid. I also loved those little vinyl 45s for children, that came with storybooks, and always loved old kids records from the 1950's through the '70s. Their used to be so many great, creative, fun records for kids in the old days, before I was born. Those records for children had all sorts of fun sound effects, characteers and storytelling. I collect old vinyl children's LP's, and really wanted my Robbert Bobbert to have the same timeless, crazy, good-time feeling as those records. By the way, the Beach Boys are still my favorite band. Also I love the Beatles, who are Max's favorite band. Actually, lately he has been really into "The Final Countdown" by Europe-- I bought him a 7" single of the song, for him to play on his turntable, so it is sort of the soundtrack around our house right now. 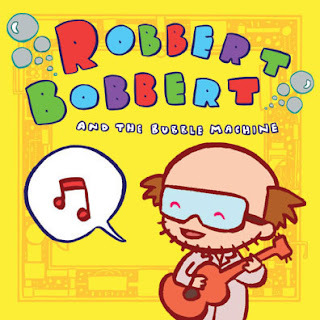 Robbert Bobbert and the Bubble Machine is out now from super-hip indie kid's label Little Monster Records. You can check out more on Robbert Bobbert and the Bubble Machine at www.robbertbobbert.com. And be sure to check out other great kid's artists at www.littlemonsterrecords.com.